While Brian Azzarello has written for several of the greatest superheroes in comics with Batman Broken City, Superman for Tomorrow (which included artwork by Jim Lee), Spider-Man Tangled Web, and Startling Stories Banner, he is most known for his Harvey and Eisner Award winning noir series 100 Bullets for DC's Vertigo Imprint. It's flawed characters and realistic, ambiguously moral plot lines have been captivating readers for nearly 100 issues. Brian's ability to weave crime stories with the help of Eduardo Risso's dark artistic tones has made fans not only of comics readers, but other well known comic creators such as Preacher's Garth Ennis, Criminal's Greg Rucka, and Watchmen's Dave Gibbons. Brian Azzarello is currently considered a "single author." If one or more works are by a distinct, homonymous authors, go ahead and split the author. 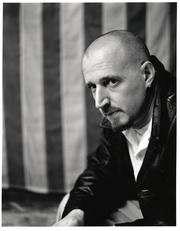 Brian Azzarello is composed of 7 names. You can examine and separate out names.